The Vail Vitality Center hosts the Winter Training Cycling Program on Tuesdays and Thursdays now through April 13. A few spots remain in the second session, held from 5:45 to 6:45 p.m. You can also call to find out if a drop-in spot is available in the earlier session, held from 4:30 to 5:30 p.m. The cost is $400 for members or $520 for non-members for the full 10-week program; drop-in rates are $20 for members and $30 for non members. 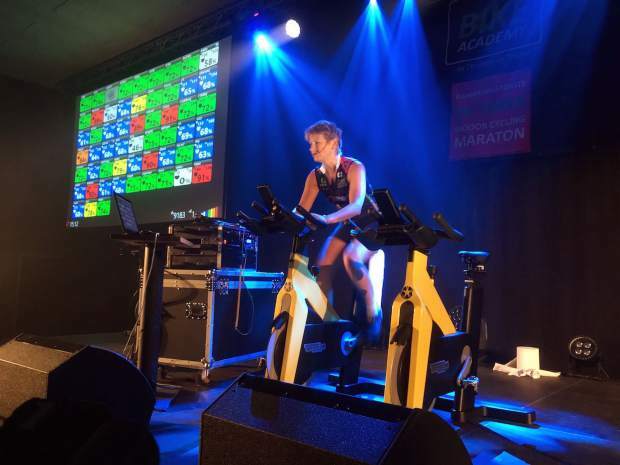 The program is led by Jennifer Sage, a professional Vail Vitality Center coach who recently returned from a trip to Denmark where she was a featured instructor at the 24-Hour Indoor Cycling Marathon, an international cycling event held in Kolding, Denmark. Jennifer is pictured here instructing at the event. Congrats on your accomplishment, Jennifer! Visit www.vailvitalitycenter.com or call 970-476-7960 to sign up for the program.